I shared some ideas in an earlier blog about how to “Teach kids to be scientifically discriminative”. This blog builds upon the idea of discussing contemporary conservation issues coupled with scientific solutions, acknowledging our influential position as teachers and parents in helping to shape student and childrens’ viewpoints. Teachers are bound to present a balanced perspective in the classroom about contentious issues, whatever their personal beliefs. The Australian Curriculum: Science, notably the Science as a Human Endeavor strand, notes that, “Science involves the construction of explanations based on evidence and science knowledge can be changed as new evidence becomes available”. News stories in the media are useful to review in order that students develop the skill of weighing up evidence and we’ll start by looking at some of these. There is a plethora of local and international media coverage about science and conservation matters, with stories often duplicated through syndicated news services. 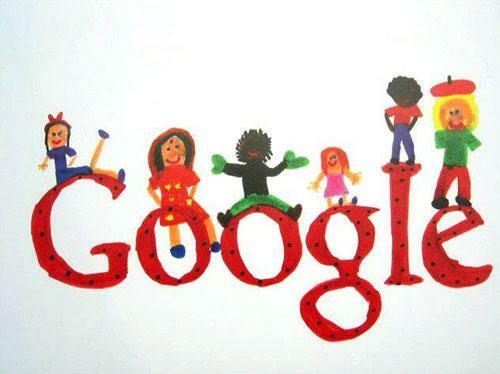 Primary aged children can be taught to search for these stories using the default search tool “Google”. The Advanced Search feature can find exactly what children are looking for by typing in the key word or phase. A second good news story, specific to our shores, which presents a “glass half full” picture has been researched and written by The Australian Conservation Foundation (ACF). 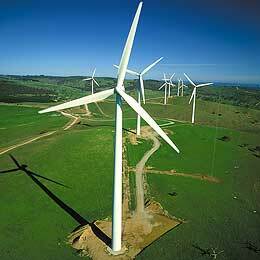 The opening of Australia’s first community owned wind farm is not the only good news story. From this adventure emerged Embark. Embark Australia is an independent not-for-profit organisation dedicated to eliminating the barriers holding back the growth of a powerful community renewable energy sector across the country. 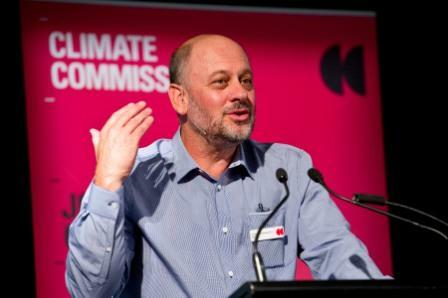 Moving closer to home, the Climate Change Commissioners, led by Professor Tim Flannery, visited Queensland last month and held a series of public forums around the state. The findings and recommendations in the highly readable report Critical Decade: Queensland Climate Impact and Opportunities are clear. A sense of cautious optimism was expressed by the commissioners that scientists are developing a growing understanding of how to mitigate the effects of global (or more specifically ocean) warming. Another positive observation was the packed house and well-informed level of questions posed by the general public who attended the Brisbane based forum. The commissioners were particularly impressed with the efforts of John Paul College in putting sustainable environmental solutions into practice in their grounds and buildings. An important caveat to these encouraging developments was cited by Queensland Conservation who made the following observation. “Unfortunately for Queensland, the new State Government remains ‘unconvinced’ by the science of human induced climate change, but appears to have no credible science to back this position up.” Polarised viewpoints may be challenging and confusing for students and teachers to dissect and interpret. However, the organisational wing of the Liberal National Party’s vote to “remove environmental propaganda” on climate change from Queensland schools” cited in The Australian is likely to narrow rather than broaden student and teachers’ considered opinions on this important issue. It’s often been noted that bad news sells newspapers. Although the market share of traditional newspapers is declining this is compensated by the rapid growth of people reading breaking news via mobiles, Ipads and on-line news feeds. In terms of the balance between good and bad news conservation stories, it is far easier to find stories of doom and gloom. Another reliable Australian news source on science and conservation matters is Science in Public whose aim is to help scientists and science organisations present their ideas in the public space. An alarming multi-syndicated headline from this source flagged the fact that the Great Barrier Reef has lost half of its coral in the last 27 years. The loss was due to storm damage (48%), crown of thorns starfish (42%), and bleaching (10%) according to a new study published in the Proceedings of the National Academy of Sciences this month. This research was undertaken by the Australian Institute of Marine Science (AIMS) in Townsville and the University of Wollongong. 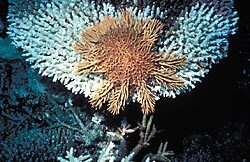 Avid listeners of Radio National may have picked up a positive news story about the deleterious impact of the rapidly proliferating Crown of Thorns starfish. An Australia-based team of marine scientists have developed what may prove an effective control for the dreaded Crown of Thorns starfish (COTS), which periodically ravages coral reefs across the Pacific and Indian Oceans. The researchers from the ARC Centre of Excellence for Coral Reef Studies (CoECRS) at James Cook University (JCU) have discovered that a harmless protein mixture used to grow bacteria in the laboratory can destroy the starfish in as little as 24 hours. I recall Berlak (an educator and author) noting that similar scenarios can be viewed and interpreted through different narrative lenses. This is very much the case in terms of weighing up the effectiveness of strategies that are designed to conserve our natural heritage. There is plenty of scientific evidence through satellite images that paints a damning picture of the world-wide loss of native forests, land and marine life. The projected growth of an additional two billion people on the planet before the world population reaches its anticipated peak towards the end of the century will add to the pressures on land use for growing food and building dwellings. As such the future looks bleak to some. But viewed through a more positive, rose-coloured lens, efforts made by conservationists in stemming the tide of habitat destruction and the extraordinary lengths that concerned communities will go to save rare or endangered species needs to be acknowledged to present a balanced picture to school children and students. In pre-industrialised Europe, and prior to European settlement of Australia, the land was considered by many to be largely unexploited and a haven for wildlife. Early Australian colonial paintings of this era depict a balanced co-existence between aboriginal hunter gatherer societies living in harmony with nature. 50,000 years of human habitation in this country prior to European contact is considered to be an ideal before the introduction of feral animals, alien plants and pests. 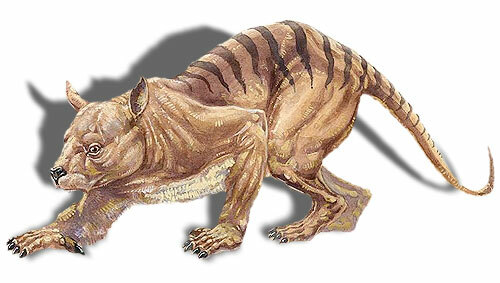 However, this early inhabited period coincided with the extinction of Australia’s megafauna; one view held by anthropologists and paleoentlogists (which is hotly contested) is the blitzkrieg theory that suggests that aboriginal people hunted these large slow-moving animals into extinction. 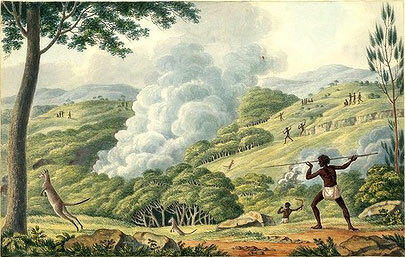 Australia’s original aboriginal inhabitants managed the landscape through selective bush-burning. Furthermore, a book by historian Bill Gammage, author of The Biggest Estate on Earth – How Aborigines made Australia indicates that the land was comprehensively managed by burning bush. Environmentalist’s utopian view of an untouched and pristine landscape in 1788 is therefore not quite accurate. The way that teachers interpret these events is critical to students’ understanding and their ability to weigh up scientific and historical evidence. The marsupial lion was one of Australia’s fiercest megafaunal animals. Was it climate change or human impact that caused its demise? Back to the present day, the worst environmental excesses of the 1970’s such as wholesale land clearance and habitat destruction have been legislated against in Australia by state and federal governments. 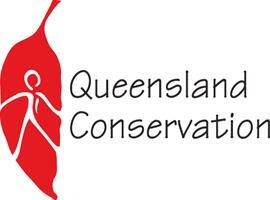 There are small and dedicated organisations and community groups striving to save threatened native flora and fauna. The proposed fencing of the Freycinet Peninsular in Tasmania to protect endangered Tassie Devils is a case in point and underpins the power of one individual’s initiative coupled with collective fund-raising action. 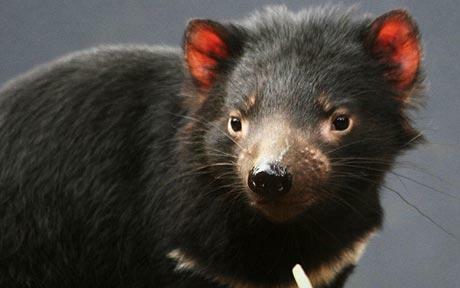 Insurance populations of tumour-free devils are now being bred beyond Tasmania’s shores in case the wild population succumbs entirely to the disease. For example, Princess Mary, a female devil with distinct genetics, has been introduced to a captive breeding program in NSW. Tumour-free Tasmanian Devils are bred in protected areas and zoos to serve as an insurance population. Millions of dollars are spent annually on eradicating plant and insect pests by Biosecurity Australia and this goes some way towards ameliorating the impact of natural and man-made environmental crises. A major project is underway for example on Macquarie Island to eradicate rabbits, mice and rats which were introduced by early seafarers and have bred and thrived in numbers despite the harsh conditions. The aim of the project is to return Macquarie Island to its original pristine state as a world-heritage listed icon renowned for its rich diversity of sub-Antarctic plants and wildlife. Nonetheless, pressures still exist between the co-existence of humans and native wildlife. 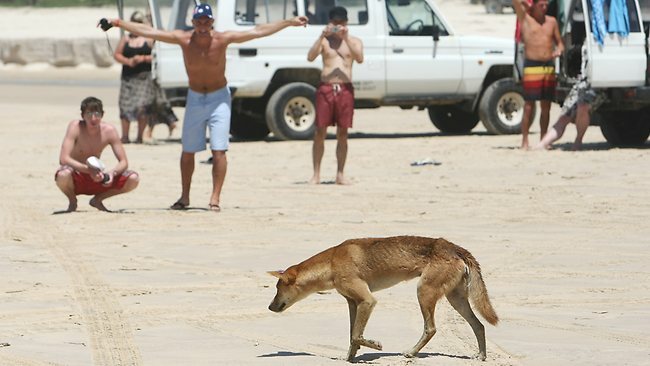 For example, on world heritage listed Fraser Island a review of the dingo management plan has recently been announced. Strategies being considered to protect visitors include fencing camping areas and the culling or relocation of some of the dingoes. The glass may be half empty and dwindling in terms of our effectiveness in maintaining a rich biodiversity within Australia as the IUCN Red List of threatened species attests. As teachers and parents we ought to consider sharing with our children the inconvenient truth that our stewardship of the land and our wildlife has, for the most part, been found wanting. But we also need to highlight some of the current concerted measures being made to protect the native flora and fauna that remain. Public education is critical to visitors respecting and coexisting with dingoes in their natural habitat. This entry was posted in Citizen Science, Conservation and tagged Aboriginal-culture, Australian-Curriculum, climate change, conservation, dingo-management, discriminating-evidence, feral-pests, megafauna, Tasmanian-Devil, wind-energy. Bookmark the permalink.